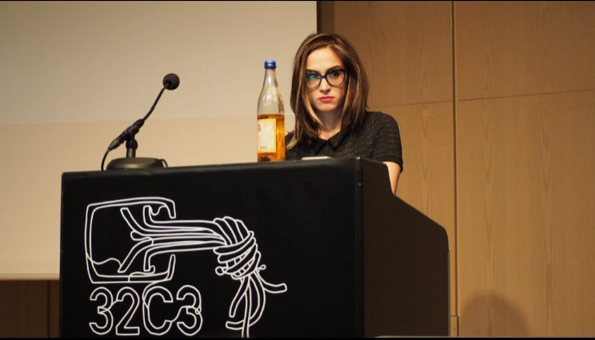 Mahsa during her 32c3 talk. Image taken by Parker Higgins. The DATACTIVE collective thought of no better way to end 2015 that to attend the 32nd Chaos Computer Congress (32c3). Four of us decided to cut into our holidays to spend the week between Christmas and New Year’s Eve in Hamburg, Germany. We joined in the annual hacker pilgrimage, somewhat of a ritual for digital activists, advocates, and techies across the world. Organized by the Chaos Computer Club, the Congress has become a platform for some key controversial talks over the year. Months after the groundbreaking release of the Snowden files, for example, Glenn Greenwald gave the keynote address at 30c3 (short for the 30th Congress), where he set the tone of the event for a rush for freedom of information and scrutiny of the surveillance complex. Many of the themes, speakers and talks of 32C3 trigger our curiosity and inspire our own research–which is why we were particularly excited that this year’s congress featured a talk by one of our own team members. Mahsa Alimardani presented her research on Iran’s censorship and surveillance apparatuses in her talk “Mobile Censorship in Iran.” She looked particularly into how mobile phones have been a target of control by the Iranian government through various projects and initiatives. She concluded her talk with a call to technologists, activists and policy analysts alike to pay particular attention to Iran’s Internet environment ahead of a sensitive political events such as the upcoming parliamentary elections, scheduled for February 25, 2016 ( past elections have been targets of Internet blackouts, digital surveillance, and throttling). Mahsa was one of the 31 female speakers out of a total of 186 speakers ; she was the only Iranian speaker, and featured the only Iran talk at the event. We encourage you to watch Mahsa’s talk and check out all the other inspiring talks and panels that animated 32c3. This one on open source intelligence was one of our favourites.